Combine sleuthing with theatrical staging, photographic knowledge, historical research, discussion, planning, publicity, collaboration and fortuitous timing. That’s what it took for students in the Contemporary Photographic Strategies class taught by Brandon Bauer (Art) to recreate a historic photo of a 1969 campus peace protest. 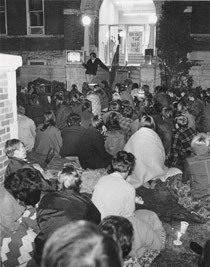 An archives’ search turned up several photos of campus peace demonstrations during the Vietnam War, including one students especially liked, of a bonfire in front of Main Hall. They quickly realized they would not receive permission to restage a bonfire. Instead they chose a photo set at Main Hall, an iconic symbol of campus. Why not just study the photo? It’s the difference between learning by looking and “learning from what was happening by actually putting the work in to learn from it,” says Dayna Seymour ’16. Plus, by recreating a photo, they could teach school history to others, says Becky Ratajczyk ’17. Some class members reported having poignant family discussions about the war. They determined that the photo probably was taken in November 1969 based on how students were dressed, a TV showing President Nixon speaking and “Bring the War Home” signs, a slogan first used the previous month. A check with the alumni office and faculty teaching then turned up nothing. ROTC archives showed that SNC protests were more peaceful than at some campuses and focused on policies, not soldiers. The class worked with the theatre discipline on costumes and props and spent a lot of time finding the right camera angle and focal length. They publicized the photo shoot to recruit more people, ending up with 25, compared to 40 in the original. 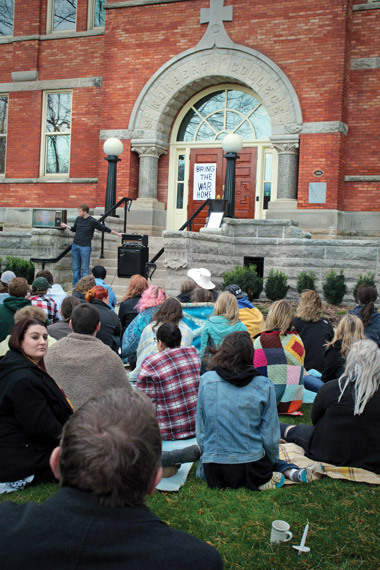 When the college scheduled a panel discussion on the Paris attacks, students shot the photos two hours earlier than planned in hopes some attendees would join them. One student who did, Tanyssa Behnke ’17, posted a photo on Instagram, including the hashtag #communio. An exhibit this semester included the original photograph, a large unedited copy of the recreation, copies of each student’s edited photo, their notes, the video loop and other shoot-related items. The students’ trip to the college archives unearthed this image from the “Year of Protest.” 1969 saw a wave of protests taking place on college campuses across the country. 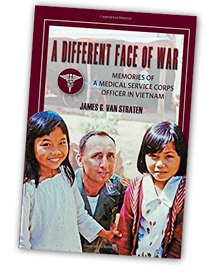 A new book by Jim Van Straten ’55 offers a perspective on the war from a medic deployed in Vietnam, drawn from the 352 letters that he wrote to his wife while deployed there. Enjoy excerpts from “A Different Face of War,” including an encounter with Maj. Joe Lutz ’55 in Saigon.